Toggle Heart bracelet in sterling silver. Gucci jewellery echoes the brands longstanding icons, from the Horsebit to the 'GG' mongram. Every piece in the Gucci jewellery range is made in Italy. 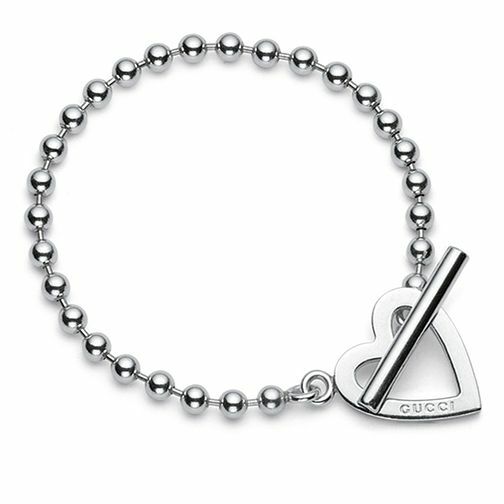 Gucci Toggle heart bracelet 17cm is rated 4.3 out of 5 by 3. Rated 5 out of 5 by Anonymous from Guuci bracelet-my daughter loved it. I bought this for my daughter for her birthday. She absolutely loved it and it looked gorgeous on her wrist. It is lovely quality and I was really please with it. Rated 3 out of 5 by Anonymous from Not recommended- faulty design My husband bought this for my birthday. Initially I loved it but very soon It transpired that the t-bar comes loose and comes through the heart! My bracelet fell off my wrist a few times, after which I stopped wearing it. When I started wearing it again, i was constantly looking at my wrist- it just so happens that my precious, sentimental gift just dropped off my wrist and is nowhere to be found. Gucci really need to re-design this product as I definitely wont be recommending it.